Just like smashed avo on toast and binge-watching your fave TV shows, travel is up there with the best things in life. 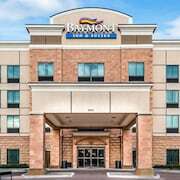 And if your travels take you to Denver, you'll find a seriously awesome range of hotels to choose from. Let’s be real — who doesn't want to stay in the thick of the action? Luckily, you'll find 54 hotels within 5 kilometres of Denver's centre on lastminute.com.au. 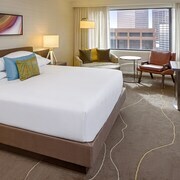 To live it up in the heart of the city, check out the Four Seasons Hotel Denver or The Ritz-Carlton, Denver. The Brown Palace Hotel and Spa, Autograph Collection and the Apartments@Convention Center-16th Street Mall also have some great facilities and amenities. You'll discover 5 available places in Capitol Hill, which is only 2 kilometres from the heart of town. 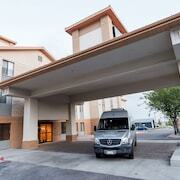 If you want to stay here, try out the Patterson Inn and Days Inn Denver Downtown. Another handy area, 0.7 kilometres from the centre, is LoDo. It contains 4 options available, such as The Westin Denver Downtown and The Oxford Hotel. Want to check out the Denver Museum of Nature and Science? The Bud+Breakfast at The Adagio and The Holiday Chalet are both nearby. How about the Denver Botanic Gardens? This incredible tourist attraction is close to the JW Marriott Denver Cherry Creek and The Inn at Cherry Creek. If the Molly Brown House Museum is on your must-see list, you might want to book a night at the Kimpton Hotel Monaco Denver or the Hotel Teatro. 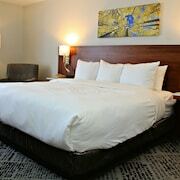 The Hilton Denver City Center and the Courtyard by Marriott Denver Downtown also have rooms ready for those who want to hang out closer to Colorado State Capitol Building. History buffs will get a kick out of Black American West Museum, the best location for exploring engaging stories from the past. If you're wanting to spend a few nights nearby, check out Embassy Suites Denver-Downtown/Convention Center and Magnolia Hotel Denver, A Tribute Portfolio Hotel Easy as! Soak up the lively atmosphere as you watch a concert at Ogden Theater. If you'd rather chill out near this attraction, consider the Queen Anne Bed And Breakfast and Crowne Plaza Downtown Denver. Totally freaking out cos you've got nowhere to crash when you land? Don't worry, last minute is our speciality! 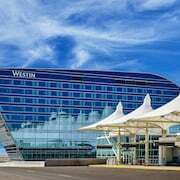 You'll find The Westin Denver International Airport a convenient taxi ride from Denver International Airport, which is 30 kilometres from the middle of Denver.